Mauricio Savarese, Sarah Dilorenzo, “Brazil’s President Says Corruption Charge Is ‘Soap Opera’” (Associated Press **, June 28, 2017). Christine Armario, “Colombia Takes Big Step to Peace as Rebels Lay Down Guns” (Associated Press **, June 28, 2017). 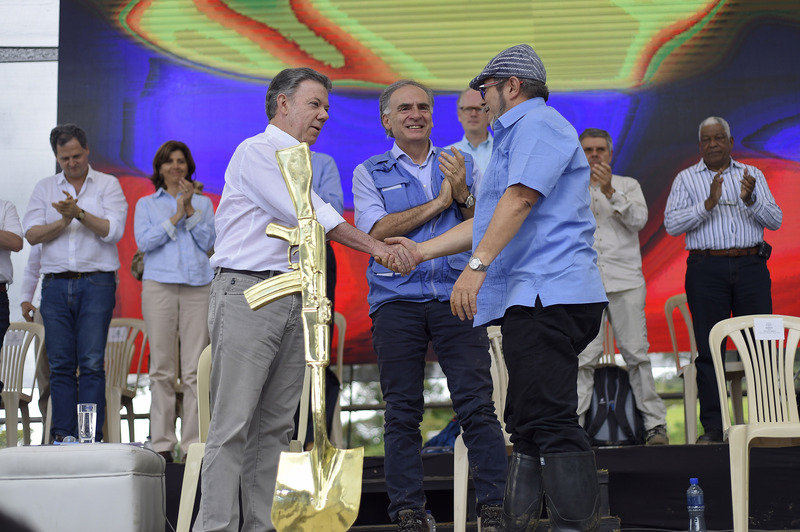 Kejal Vyas, “Ceremony Marks Colombian Rebels’ Disarmament” (The Wall Street Journal, June 28, 2017). Chris Kraul, “Half a Century of Conflict in Colombia Comes to Close as Farc Rebels Disarm” (The Los Angeles Times, June 28, 2017). “Las Farc Inician Camino a la Politica Sin Armas” (Verdad Abierta (Colombia), June 28, 2017). “National Director of Anti-Corruption in Colombia Charged With Conspiracy to Launder Money in Order to Promote Foreign Bribery” (Southern District of Florida, U.S. Department of Justice, June 28, 2017). Jorge I. Dominguez, “Can Trump Compete With Obama on Cuba?” (The New York Times, June 28, 2017). Melissa del Bosque, “Over the Wall: How Texas Border Communities Are Gearing Up to Fight Trump” (The Texas Observer, June 28, 2017). Silene Ramirez, Eyanir Chinea, “Helicopter Attacks Venezuela Court, Maduro Denounces Coup Bid” (Reuters **, June 28, 2017). Ernesto LondoÑo, Nicholas Casey, “Police Officers in Helicopter Attack Venezuela’s Supreme Court” (The New York Times, June 28, 2017). Alex Daugherty, “The Trump Whisperer: Marco Rubio Has the President’s Ear on Latin America” (The Miami Herald, June 28, 2017). Daniel R. Mahanty, “The “Leahy Law” Prohibiting Us Assistance to Human Rights Abusers: Pulling Back the Curtain” (Just Security, June 28, 2017).